Register for our ONLINE OPEN DAY. You will be able to chat live with faculty and staff, watch videos about Schumacher College, the Dartington campus and learn more about each programme. People from all over the world, of all ages and backgrounds, have been informed, inspired and encouraged to act, by our transformative courses for sustainable living. Schumacher College has an enviable reputation for cutting-edge learning. Our work is to inspire, challenge and question ourselves as co-inhabitants of the world, to ask the questions we all struggle to find answers to and to find sound knowledge, intuition, and wonder in our search for solutions. We bring together the leading thinkers, activists, and practitioners internationally, to deliver a unique brand of small group learning experiences. This learning takes place in the classroom, the gardens, the kitchen – it is part of everything we do. 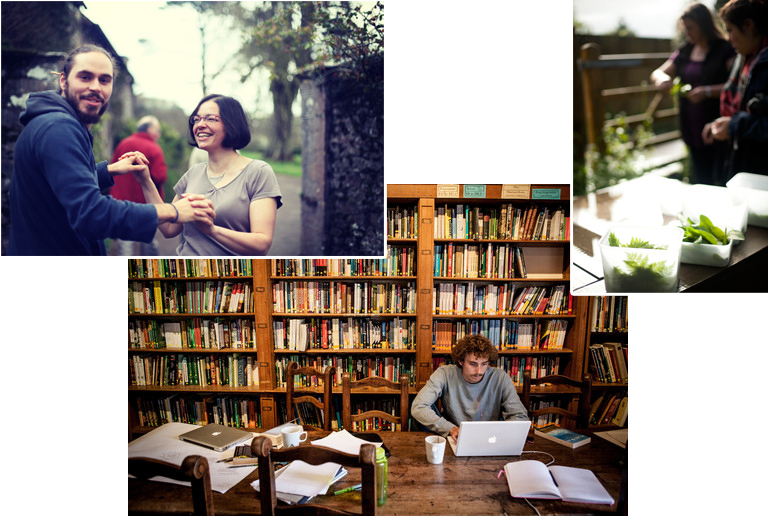 If you come to Schumacher College for a postgraduate programme, short course or vocational training, you will be part of our international learning community in the beautiful surrounds of South Devon, on the Dartington Hall Estate (link is external). The Dartington Hall Estate was founded in the 1920s by two charismatic entrepreneurs, taking their influences from east and west to set up an experiment in rural regeneration. Their vision was based on progressive forms of education, art, and agriculture – a legacy which we continue today. Coming here is a rich and diverse experience which allows you to mix with like-minded students, teachers, and activists who are striving for positive change in the world. Schumacher College is a place where you will meet friends and allies from all walks of life and from all parts of the globe, who share an interest and a passion for the planet we inhabit. Schumacher College courses are of the highest quality and offer learning and teaching that is seldom found in Universities and Colleges today. The unique nature of the courses is not only in the content but in the way you as a learner are actively involved as a co-creator. You will not be a passive receiver of knowledge here, but you will be expected to be an active learner seeking out solutions to questions that nobody has yet answered. 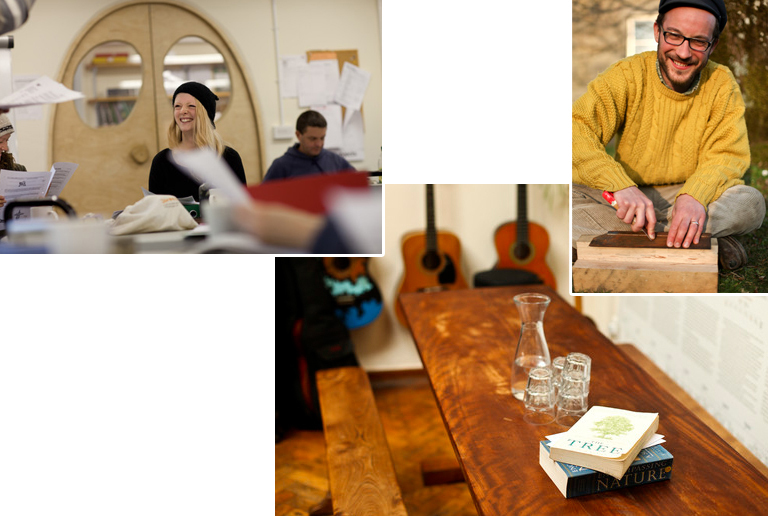 Schumacher College is a rigorous and demanding place and our students are an integral part of making the learning experience unique, unforgettable and totally life-changing. You will be a part of the rich tapestry which makes up the College on a day to day basis, mixing with students, volunteers, apprentices, visiting teachers, practitioners, speakers, and performers. The best learning happens in groups. We endeavor to run our Short Courses with an average of 20 participants and our Postgraduate Programme with 15, although this is subject to variation. This enables you to get the best out of your interactions with each other and with your course teachers and facilitators. We employ a range of teaching methods and facilitated processes to ensure that both group and individual learning opportunities are maximized and that a real sense of co-creation and belonging arises regardless of the length of your stay at the College. We start the day with a communal morning meeting to go through the business of the day and to allocate workgroups and tasks. All students and staff take part in daily activities of cooking, cleaning, and gardening which, apart from being integral to our learning, helps to foster a sense of community and is a great opportunity to mix with all members of the College. Where possible we encourage student participation in the wider community of the College. We have regular open evenings for the public where our short course teachers give Earth Talks. This is a great opportunity for students to mingle with local residents. We also make the most of our partnership with Transition Town Totnes (link is external) – the home of the international Transition Movement – who are regularly invited to give talks to our students. Everything we do is with consideration of its impact on the wider world. We are lucky to be based in a very beautiful part of the world, with the historical legacy of the Dartington Hall Estate behind us and the College itself in an atmospheric listed building – The Old Postern. The upkeep and running of the College is not without challenges in terms of sustainability, but we aim to walk our talk on a day to day basis. Our library is a hugely valuable resource, containing books and archive footage going back through the 20 years of our existence as a College. Some of the biggest names in sustainability and ecological living have visited us over this time and our collection reflects this. Students, writers, and journalists often visit us on retreat to use this facility. As a student, you will have unlimited access, seven days a week. Some people keep coming back to the College for the food alone! Our team of in-house chefs (with support from yourselves) prepares delicious vegetarian, organic and locally-sourced food at every meal time. The standard of food is so good that our regular cooking courses sell-out very quickly in advance. A significant portion of the food is grown in the College’s 3.5-acre grounds, which are managed by the College, with the help of students and volunteers. As well as food growing, the grounds include areas specifically for wildlife, contemplation, and inspiration in nature. The gardens are managed on ecological principles, and permaculture design approaches. Beyond the College are the farm and beautiful grounds of the Dartington Hall Estate. Take a walk through the mixed woodlands surrounding the College, along the River Dart which runs through the Estate, or through the ornamental gardens of Dartington Hall itself for art-related events and festivals plus the cinema, theatre and art-spaces. Venture further afield to the town of Totnes, only 20 minutes on foot, to experience the best the town has to offer in terms of alternative living, green community, and complementary healthcare. Or take a trip to the wilds of nearby Dartmoor – an area of immense natural beauty in our neighboring landscape. The stunning South Devon coast is also close by, with wild rocky cliffs and sandy beaches.